This is the tagline of “The Crimson Petal and the White”, a mini-series that unfolds the story of a young prostitute named Sugar living in London in 1875. 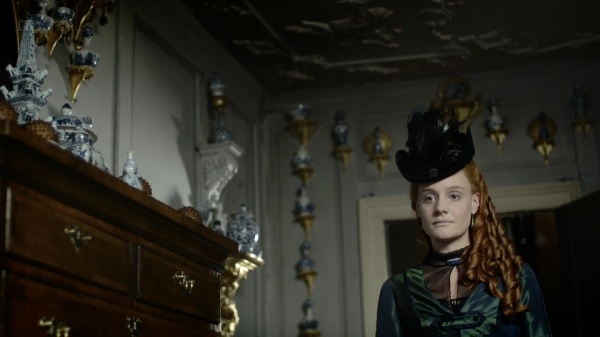 Played by Romola Garai, the young girl chances upon a married heir to the family perfume business and uses her passion for literature to ensnare his mind away from the unstable situation at home. 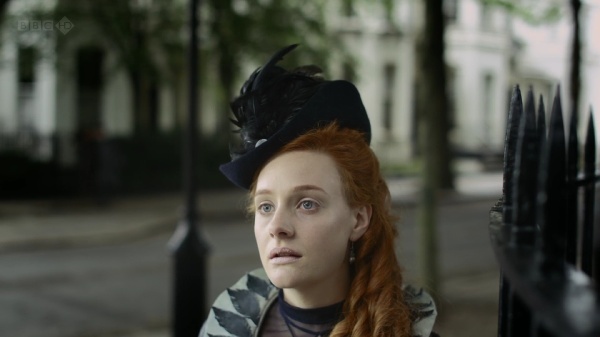 Pushing the limits of broadcasting censorship, “Crimson Petal” offers an unfettered look at the lives of rich and poor – alternating between unsettling and riveting, revolting and fascinating, voyeuristic and enchanting. Sugar’s fiery golden tresses highlight the sensuous setting of the local brothel, with deep reds, greens and golden browns welcoming the customers onto the premises. The first encounter between Sugar and William Rackham places the viewer at a nearby table, with dancing candlelight flames and blurred reflections framing her face. As she deftly weaves the conversation and plays to his vanity, the camera never goes below her neck, highlighting his noetic enchantment with Sugar. This is the beginning of a scene where Rackham talks to the brothel’s mistress, offering a full patronage arrangement for Sugar. While the conversation is very detached, deep reds and yellows highlight the very intimate nature of the transaction. Note the richness of the dress, chandelier and the tapestry – all in the area that welcomes the customers. As Sugar herself is listening to the conversation, the camera places the viewer half peeking from behind a curtain. The cool colors of the environment – turning her fiery hair into sand brown – highlight her emotional detachment from the impending transaction. She has been planning this move all along, deftly planting the idea seed in his mind. All that is left to do is to complete the deal. And here she is, a few moments later, entering the scene and “adopting” the rich sensual palette that washes her hair and face in deep ember. 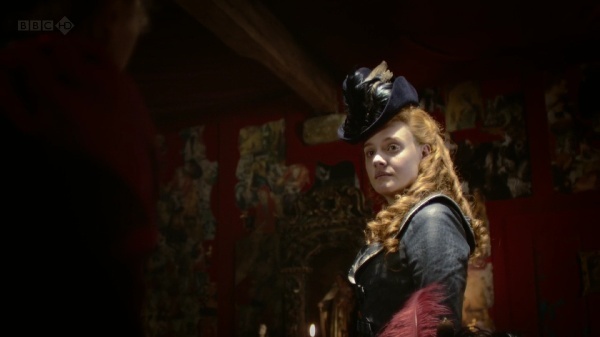 This color transition from warm to cool and back to warm is one of the best color sequences in “Crimson Petal” and is certainly worth rewinding a couple of times. With Rackham back at his house, Sugar bids farewell to the mistress. A short conversation reveals many intimate details, including how the mistress (which is also her mother) pushed her to sell her body. The dialog is brief and very cold, and is washed in desaturated browns, cool blues and soft yellows – with not a single hint of a warm color anywhere in the frame. 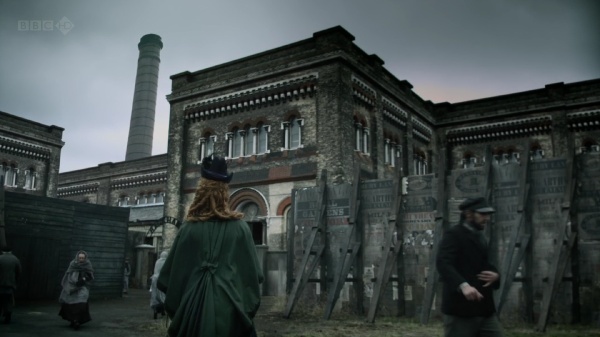 As the story begins to unfold in the winter, the outside scenes in the Victorian slums are dominated by grays tinged with sea green. 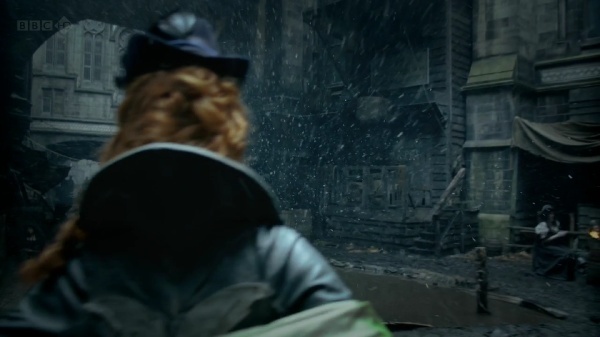 Even these few short moments that the main characters spend outside are enough to show the destitution and despair that engulfs the poor parts of the capital. The stark contrast to the lush interiors of the Rackham residency is just another reminder of why Sugar is so desperate to claw her way out of this misery. It comes from a Tennyson poem that begins “Now sleeps the crimson petal, now the white”. But the poem has no particular relevance to my story. I like the complexity of associations suggested by crimson and white—Sugar is a “scarlet woman” but she is mistaken for an angel by Agnes Rackham, and is also desperate to move into a new life that’s respectable and innocent. 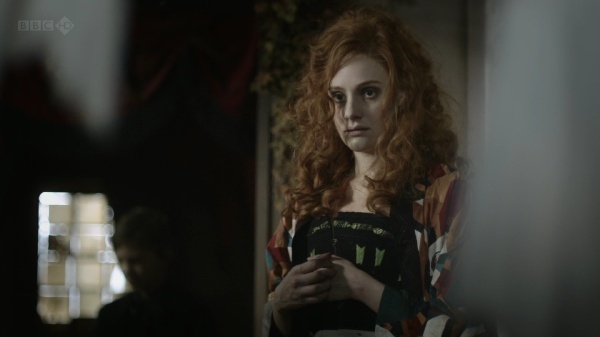 Agnes is, by birth and inclination, pure white, but is troubled by the phenomenon of blood. William uses and destroys petals of both colours in his profession of perfume manufacture. This is just one of many scenes that happen in the Agnes’s bedroom. Bedridden with frail body and mind, she spends most of her time surrounded by the sea-green floral patterns of the wallpaper, oppressed by the frequent visitors of the family doctor. Elsewhere in the house, the wallpapers and tapestry are much lighter and warmer, with bright patterns dominating the dining room and mahogany red wrapping the main family room. Kirill: Tell us a little bit about yourself and your busy schedule. Luke: I’m a freelancer of TV drama and have been for 15 years. Budgets have steadily been reducing in real terms so schedules become ever more squeezed. So I find myself in the cutting room from pretty early to late in the evening. Kirill: As the editor, how important is it to spend your time on the set reviewing the daily shoots? Luke: I spend very little time on set. In fact I feel like a spare part when I’m there as there’s nothing for me to do except be positive about the dailies I’ve been given. There is the odd occasion where it’s necessary to visit the set for a specific problem but they’re rare. However, reviewing the dailies is terribly important; I need to be able to watch them and give constructive feedback to the director on set. 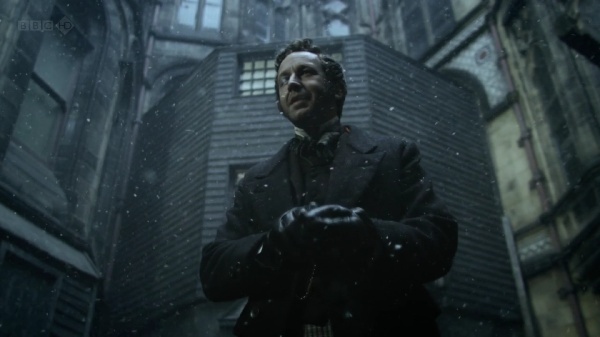 Feedback can range from coverage (the lack of it and whether it will cut together as a story and whether we need any pickups) to an actors performance up to the look of the show. Kirill: Given how much time you spend with the director during the post production stage, is there a special bond of trust that is developed? Luke: Definitely. It’s essential. The more you work with a director the easier it is to interpret their vision. You build a trust that works both ways; so if I say something isn’t working, even if the director loves it, then they will listen. They won’t always change it but they will listen. Plus, if you’re with one person for 12/16 weeks you have to have fun. Kirill: You’re mostly doing TV productions for BBC these days. Knowing the hard limits on each episode length, how far is the editor’s cut from the final product that the viewers see on the screen? Luke: By editor’s cut you mean the 1st assembly I think. That is always 10 to 20 percent longer than the final product. It’s usually in scripted order and it has what I call fat in it. As an editor you know from that assembly where you want to make trims, add music, move scenes and generally start shaping it. Depending on the director you could do that before they see it in scripted form or, if they trust you, you can start shaping it before the end of the shoot. Mostly I’m somewhere in the middle. Kirill: On a related note, how different are editor’s days between the movie and TV productions? Luke: None really. They’re all long. 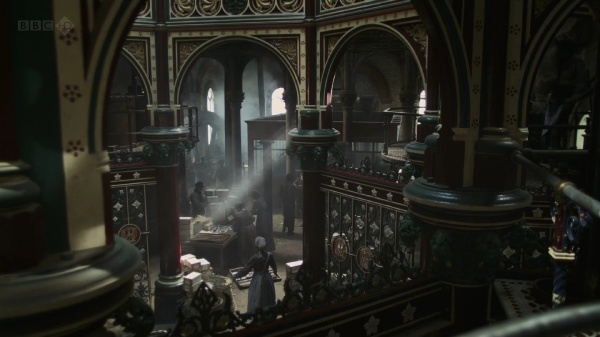 Kirill: How much of the eerie atmosphere of “fallen” London streets and the opulence of the upper class surroundings was done during the post production? Is it mostly the right selection of camera equipment or dynamic software processing? Luke: Obviously the design was a huge factor, which meant that Lol Crawley (director of photography / DOP) could shoot it in a particular fashion. What we did in post was a combination of sound, light and image manipulation. Very early I started playing with the idea of drones. I sent Marc Munden (director) a cd of about 90 drones that he loved (not all of them). We added them to scenes for atmosphere and tension. Lol (DOP) and Grant Montgomery (designer) did such a fantastic job that when it came to grading the series they had a great deal of scope. And finally image manipulation; there are about 50 shots per episode that we changed from their original format. This might have been as simple as adding a zoom, but occasionally I would stretch an image (a bit like a circus mirror) to hopefully add unease. You can’t stretch it too much though or it looks silly. Kirill: What part do the advances in professional editing software play in merging all editing responsibilities in the hands of a single editor? What are your current tools of trade? Luke: I’m currently using Avid media composer and have done for years. I like to think that the tool doesn’t make that much difference it just makes you quicker (I can cut as quickly as I think). Obviously nowadays you are expected to add temp music, vfx and sfx and this is made easier in the non-linear world. Kirill: “Crimson Petal” has a lot of close-ups with dynamic focus and lighting effects. Is this something that you’re doing during editing, dynamically altering the frame selection and applying various continuous effects? Luke: Not really. Lol used 1970s Prime Canon lenses that had a very shallow depth of field and a slight softness to them. I thought it looked great but you should ask him about that. Kirill: Some of the productions you’ve worked on (including this one) are adaptations of much lengthier books that have the luxury of conveying characters inner thoughts. How far can you as the editor take an adapted script and use the visual tools at your disposal to bring the viewer closer to the original complexity? Luke: It’s very hard, especially if there’s an inner voice. you can get round that with voiceover/narration, but that is very much down to the screenplay/script. Kirill: Some people spend inordinate amount of time ferreting the smallest physical discontinuities, even if they don’t matter for engaging the viewers in the emotional story lines. Is this something that bothers you? Luke: Not at all. If someone is overly concerned with continuity then we have failed them because they’re not engrossed in the story. 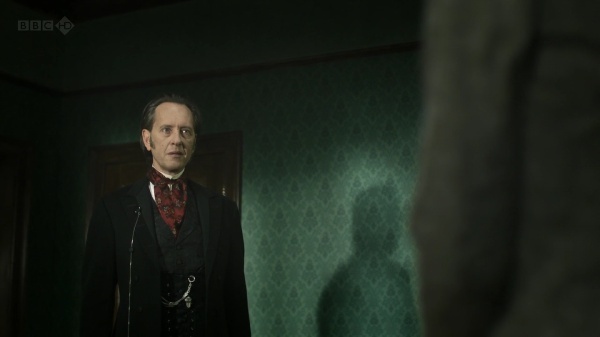 There’s a very obvious continuity jump in Crimson where Mark Gatiss’ character knocks over a teapot and the proceeding shot it’s upright. We kept it in because on numerous viewings it was never noticed, people were watching the actors not the props. The best take for performance is always the priority. Kirill: Can you recommend a few of the productions (movies or TV) that have particularly impressed you? Luke: There a whole host coming out at the moment that are very good, I think British drama is in rude health. I’m particularly enjoying the Shadow Line at the moment. Kirill: What’s next for Luke Dunkley? What are you working on these days? Luke: Currently I’m working on the first three episodes of a new BBC3 series called The Fades. A graphic comedy horror – should be on screen in September. And here i’d like to thank Luke for his work on this production, and once again for taking the time to do the interview. As for the readers – i hope you enjoy the series as much as i did.